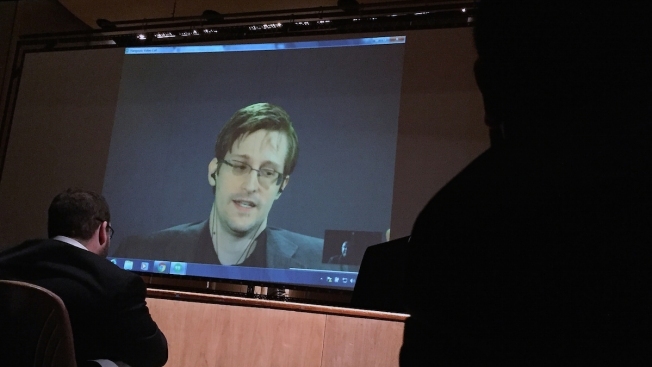 Speaking via Skype from Russia, Edward Snowden told an audience of supporters in New Hampshire on Saturday that he is willing to be extradited to the United States if the federal government would guarantee he would get a fair trial. The former National Security Agency contractor in 2013 leaked details of a secret government eavesdropping program and left the country. He faces U.S. charges that could land him in prison for up to 30 years. Snowden spoke Saturday at the New Hampshire Liberty Forum, heavily attended by libertarians. WMUR reported that forum organizers did not allow the media to video record his remarks. "I've told the government I would return if they would guarantee a fair trial where I can make a public interest defense of why this was done and allow a jury to decide," Snowden told his audience. Snowden has previously spoken of making offers to the government to return home and his willingness to discuss a plea deal and even go to jail. Last year, former U.S. Attorney General Eric Holder said a plea deal with Snowden was a possibility, but Snowden told the BBC in an interview in October that he and his lawyers were still waiting to hear from the government. Snowden's revelations about the NSA, Britain's GCHQ and other intelligence agencies set off an international debate about spies' powers to monitor personal communications, and about the balance between security and privacy. Critics say his disclosures harmed the ability of the United States and its allies to fight terrorism. To some, he is a traitor; to others, a hero. Saturday, Snowden said that while some of his former colleagues at the NSA and the Central Intelligence Agency were sympathetic to his beliefs concerning individual privacy and freedom, others said "the Constitution doesn't really matter."